There are a few rules that go along with the use of all passes that are available for check out. #1. It is a first come/first serve item. We DO NOT take reservations for this item. #2. There is a three-day limit to the time that you may have the pass. #3. Please return the pass to the current staffer, do not place in dropbox outside. #4. You must wait at least 48 hours before taking the pass out again. This will give other community members the opportunity to take advantage of this great pass. #5. Fee for lost pass: $50. These passes are located at the desk - just ask the staffer to check them out. Vermont State Parks: This pass provides free entry into any Vermont State Park day areas for up to 8 people in one vehicle. Day use areas are generally open from 10 a.m. to sunset. See the back of the pass for a list of Vermont State Parks, or go to http://www.vtstateparks.com for more info. You may also wish to download the Vermont State Parks app for your iphone! 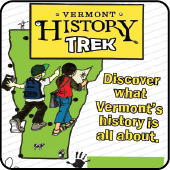 Vermont Historic Sites: This pass, provided by Vermont's Historic Sites and the Department of Libraries, gives free entry to Vermont State Historic Sites for one family or groups of up to 8 people. State Historic Sites are open through Columbus Day, with the exception of the Bennington Battle Monument, which is open through the end of October. See a list of sites, with directions, hours, and more information, on the Vermont Historic Sites website. Questions may also be directed to the Vermont Division for Historic Preservation at 802-828-3051. ECHO: This pass provides reduced admission (currently $4 per person) for a family of up to two adults and three children to the ECHO Lake Aquarium and Science Center in Burlington, VT. Some special exhibits require an additional admission fee. ECHO is open daily, year-round. Learn more and read about current exhibits on the museum's website or by calling 802-864-1848. Valid for regular admission for 2 adults and 3 children under 18. Tuesday, Thursday, Friday & Saturday 10:00 AM – 4:00 PM, Sunday 1:00 – 4:00 PM, Closed Monday. Wednesday group reservations only. See calendar for holidays and special events.